"The limited introduction of folklores and the unattractive way of delivering makes a lot of folklores not grow among the younger generation. If it continued to be like this, some folklores may disappear or even extinct" said Dianika Aditya Mustaqiem, Head of the Student Creativity Program (PKM) Dirgantara. Based on the lack of public knowledge of Indonesian culture, four Bogor Agricultural University (IPB) students: Dianika Aditya Mustaqiem, Muhammad Alif Hanif Afif, Rizal Fikri Alamsyah and Irfan Nugraha from the Department of Animal Production and Technology, Faculty of Animal Husbandry under Iyep Komala , S.Pt, M.Si initiated an innovation to be able to preserve the folklores which is one part of Indonesian culture. This innovation is named "Dirgantara". Dirgantara is a clothing brand innovation that promote folklores as the main design of its products. Dianika Aditya Mustaqiem explained, "Dirgantara design products will be packed in a modern and elegant way that will be one of the unique features of this product." In addition to improving self-confidence with modern clothing models; knowledge and insight into folklores of people using products Dirgantara will increase. "Another uniqueness of our product is to include the explanation related to the culture that is appointed to be the main design of each product, hope this product can become the media of Indonesian folklores to the public, especially the young generation, including foreign tourists," Dianika added. Creative ideas to promote Indonesian folklores is inspired by the creative industry products that also raise the theme of “Cinta Indonesia (Love Indonesia)”, such as culture or about nationalism. 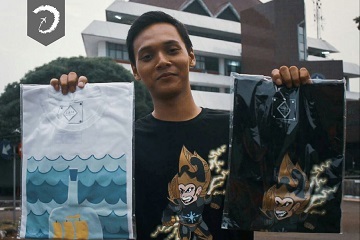 "In our opinion, if the products that exist today just deliver their culture in general, in the sense they just informed what culture is in their products and have not clearly explained about, the culture from which we are inspired to make the product which brings the theme of Indonesian culture, especially folklores which is poured in the form of clothing (shirt) with the explanation of the culture so that information related to the culture can be conveyed to the consumer," he said. Thanks to the creative innovations of Dianika and his team, they were awarded with the Entrepreneurship Student Creativity Program (PKM-K) awarded by Ministry of Research, Technology, and Higher Education of Republic of Indonesia.